Richard Protherough’s men have beaten Loughborough Students and Chinnor in their last two matches, which has allowed them to move out of the relegation places. Moseley are one point clear of the drop zone, while bottom of the table Esher find themselves 10 points from safety so regardless of the result in the Midlands, it will certainly affect the battle for survival. Also embroiled in the relegation scrap are Loughborough who host Blackheath on Saturday, while rivals Caldy travel to Rotherham Titans, Sale FC entertain Chinnor and Cambridge visit title chasing Old Elthamains. As for the promotion race, the aforementioned OEs come into this weekend five points adrift of league leaders Ampthill & District and in terms of the table toppers, they will be keen to extend their winning run to nine games when they visit Darlington Mowden Park. Fellow title contenders Rosslyn Park, who also sit five points off the summit, take on Plymouth Albion while elsewhere, Cinderford face Bishop’s Stortford. Following their victory over title rivals Old Elthamians in Round 25, Head Coach Paul Turner stated it was a ‘great day for Ampthill.’ It could prove to be the defining day in this title race too as the A’s moved to the top of National One after their 36-6 win over OEs. Ampthill are now five points clear with five games to go and the final two weeks in March could also be decisive as they aim for a place in the Championship. At the end of the month, they take on fellow promotion contenders Rosslyn Park in another huge clash, but first up for Ampthill is a tricky trip to Darlington Mowden Park. 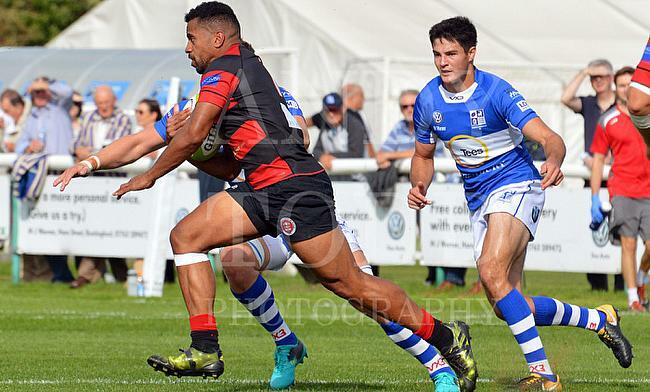 The hosts did lose last time out against Plymouth Albion, however, DMP will be wanting to bounce back this weekend as they look to continue their excellent 2019. Danny Brown’s men occupy sixth spot in the table and they have only lost one of their last six games at the Northern Echo Arena. This won’t be straightforward for Ampthill and DMP are more than capable of distributing their title bid. The hunted have now become the hunters. Old Elthamians had been in control of their own destiny for well over a month in National One, but last time out, they were knocked off their perch. Gavin Lach’s side lacked a rare cutting edge and their failure to convert chances saw them fall to a defeat against title rivals Ampthill. It brought to an end a run of seven straight wins and OEs are now five points off the summit as they prepare to host Cambridge. On paper, OEs do have a more ‘favourable’ final five games than the likes of Ampthill and Rosslyn Park because they play four teams currently in the bottom half and one of those sides are Cambridge. Director of Rugby Richie Williams will be hoping his side can turn their fortunes around as soon as possible because the Blood and Sand sit just one point clear of the relegation places as they head into Round 26. Williams also told the Cambridge Independent that there is no expectation on his side ahead of this clash with OEs and that certainly could work in Cambridge’s favour as they aim for a positive result. Six wins in a row has left Rosslyn Park in a fine position to challenge for the National One title. Following Ampthill's victory over Old Elthamians in Round 25, Kieran Power’s side are only five points off the top and I think it is fair say the next two weeks will shape the rest of the campaign for Park. Next Saturday, they take on league leaders Ampthill, but their main focus will be picking up a victory against Plymouth Albion in Round 26 to keep their title bid alive. Plymouth will arrive in the capital after their ‘best performance’ of the season according to head coach Kieran Hallett. Albion bounced back from their loss against Old Elthamians to defeat Darlington Mowden Park as they maintained their excellent form at Brickfields. Plymouth will now be keen to enjoy some success on the road and a win at the Rock would certainly boost their ambitions of finishing in the top six this term. Blackheath head into Round 26 in excellent form. A comfortable and impressive victory over Cinderford last time out saw James Shanahan’s side extend their winning run to four matches and ‘Club’ are still in the promotion conversation. They may be eight points behind Ampthill, but Blackheath are going about their business nicely and are waiting to pounce on any mistake from the teams above. ?? The purple army needs you ?? The men from Well Hall will be hoping to make it five straight wins this weekend, but they take on a Loughborough Students outfit who will be up for the fight. The Midlands club currently sit 15th in the table and they are now seven points from safety following their excellent win over Sale FC in Round 25. Loughborough do have a tough run-in on paper with the likes of Chinnor, Plymouth Albion and Ampthill still to play, but with five of their six victories this term coming on their own patch, they will be keen for some more home success this weekend. It was a welcome shot in the arm for Rotherham Titans in Round 25. Following three straight losses, Joe Barker’s side displayed a lot of grit and determination to battle to a victory over Cambridge two weeks ago and now the Yorkshire club will be hoping for a strong end to the season. After relegation from the Championship last year, inconsistencies for the Titans have plagued their promotion bid this term but Rotherham will have their sights set on building towards the 2019/20 campaign. The Titians will also be keen to secure back to back wins for the first time since December when they host Caldy on Saturday. While the home side maybe focusing on next season, the visitors to Clifton Lane are fully concentrated on the final five fixtures of this current term. As things stand, Caldy are in the bottom three and are one-point shy of safety following a run of four straight defeats. Just one victory in their last 11 matches has seen them slip towards the trapdoor and their run-in doesn’t look to promising. Four of their last five matches come against sides in the top half and without an away win since November, can the Wirral outfit gain a positive result in Yorkshire this weekend? Chinnor currently occupy seventh place in National One and if you had offered them a top half finish at the beginning of the season, there is a strong chance they may have taken it. Matt Williams’ side have had a very satisfactory debut campaign in the third tier, but the Black and Whites will be eager to end the term on the front foot after a recent dip in form. The Oxfordshire club have lost six of their last seven games, but they have the chance to respond when they travel to Sale FC in Round 26. The home side will also be looking to bounce back on Saturday as last time out, Jonathan Keep’s men suffered a disappointing defeat to Loughborough Students. Sale’s recent form has been encouraging, but because of the resurgence from a couple of sides below them, the Manchester-based club are only four points clear of the drop zone. Three of Sale’s remaining five games come at home and their last four wins have all been at the CorpAcq Stadium so they will be hoping to add another victory to that tally this weekend. After defeating Caldy in Round 24, Cinderford were unable to back their victory up a week later as they were outclassed by Blackheath at Well Hall so Paul Morris’ men will want to return to winning ways on Saturday. The Foresters have performed well on their return to National One and a top eight finish would represent a positive season for the Gloucestershire club, who currently sit ninth in the league standings. In Round 26, they travel to a rejuvenated Bishop’s Stortford. Since the beginning of 2019, Andy Long’s side have been superb and it looks as though their dramatic upturn in form has secured them a place in National One for a third year on the trot. The Hertfordshire club have won seven of their last eight games and after languishing in the bottom three, Stortford are now eight points clear of the drop zone. They are not safe just yet, but a victory at Silver Leys this weekend would all but guarantee them another season in the third tier. Birmingham Moseley have turned it on when it matters most. The Midlands club have secured back to back wins since the beginning of the month and now Richard Protherough’s side have moved out of the relegation places. Moseley’s win over Loughborough and their outstanding display against Chinnor means they are one point clear of safety with five games remaining. With Esher as their next fixture, Moseley now have a real chance to continue moving away from danger, however, the Surrey-based side will have other ideas. Tom Williams’ men are currently at the foot of the table and find themselves 10 points from safety heading into a huge clash this weekend. Esher have lost their last six games and with fixtures to come against rivals Sale FC and Loughborough over the next couple of weeks, this could be a defining period in the season for the men from Molesey Road.